What if China said ‘no’ to new coal? Head of Modelling, Hector Pollitt, sends us a report from the United Nations climate change talks (COP24) in Katowice, Poland. The mood going into COP24 has not been overly positive. Yes, there are record numbers of renewables installations, but global emissions are still increasing. There seems little chance of a political breakthrough and we don’t even have a host for next year’s event. A reversal of US policy would obviously be seen as a positive step towards reducing global emissions and, as we have shown previously, would be good for the US economy. But there is still plenty of action being taken in the US at sub-national level, and technological trends are pointing towards emission reductions even in the absence of federal measures. What impact would a halt to new coal plants in China have on emissions? If I’m only allowed one change, then it has to be big enough to matter. That points towards China and its use of coal in the power sector. There are well over 1,000 energy using sectors in the E3ME model. China’s power sector has by far the largest emissions, more than double the next highest. According to the E3ME data, it accounts for around 15% of global CO2 emissions. Most of it is due to coal. So what if China stopped using it? 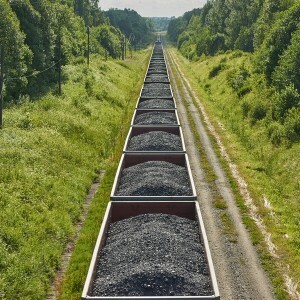 The UK has pledged to phase out coal in the power sector by 2025. Given existing capacity, this is not feasible in China, but it might be more realistic for no new coal plants to be built, and existing ones to shut down at the end of their lifetimes. The signals coming out of China are mixed – there are major concerns about air quality from the use of coal but new plants appear to be under construction (sometimes illegally). And of course solar is becoming ever-more competitive, even with coal plants that have already been built. So the scenario may not be completely unrealistic. 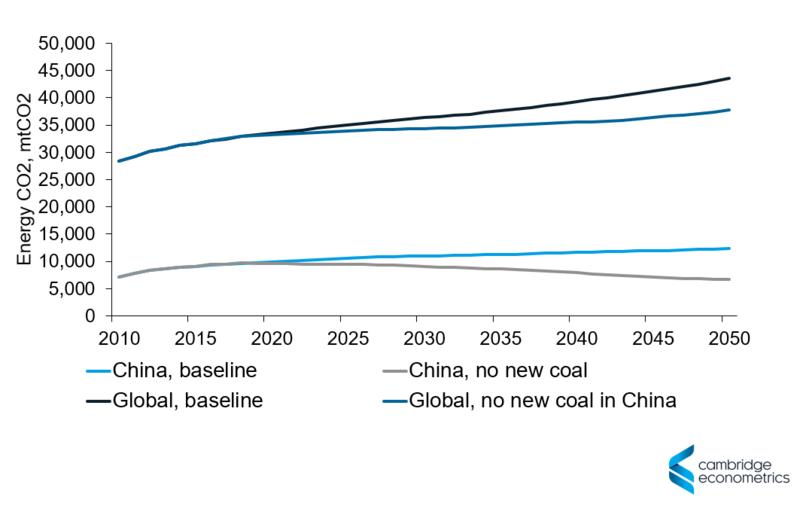 The chart below shows what no new coal plants in China would mean for emissions in China and for the world as a whole. Within China, emissions would immediately start decreasing, meaning that its Nationally Determined Contribution (NDC) is met early. By 2050, Chinese emissions are almost 50% lower than our baseline projection. However, global emissions still increase over time in this scenario and although the measure could knock almost 0.5C off global warming, 2C would not be close to being met under this scenario.